This is a unique pattern as you can adjust it for your needs, in fact, it's necessary to have good measurements prior to starting and if you're making them for yourself, try them out as you go to make sure that you get a good fit! Determine the height that you want on your ribbed section. You can choose to have them short, as pictured above, or long, so that you are able to fold the ribbed section over. Chain as many as you need to obtain the height that you desire. For the example above, I chained 11. Make sure to make a note about how many you used for when you make your second cuff. R2: (in back loops only) sc across the row, ch1, turn. Repeat Row 2 until you have enough length to stretch around your calf. Remember that you want it slightly smaller than the place on your leg where you will wear it, so that it stays snug and doesn't slide. FO, leaving a long tail for finishing. join the first row with the last row to make a tube, sewing them together with your tail. * If you just want a ribbed cuff, you can stop here. For the shelled side, continue on. R1: ch 1, sc, *ch 3, sk 2 st, 6 dc in next sc, sk 2 st, sc in next st* repeat around, joining with sl st in top of first sc. Pay attention to where you are, as you may need to adjust the length of one shell depending upon how many rows you ended with to fit your calf. You don't want to make it too snug either as the shell doesn't stretch as well as the rib. R2: sl st to top of 4th dc of first shell, ch 1, sc in same. *7 dc in sc between shells from previous row, sc in 4th sc of next shell* repeat around, joining with a sl st in top of first sc, FO, weave in ends. Make a second using the same chain amount from the beginning of the pattern to ensure they're the same. 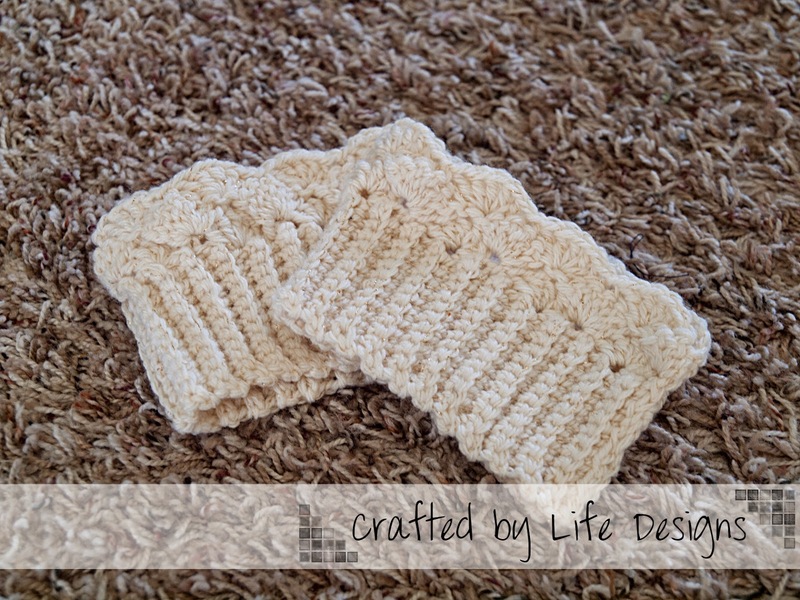 Enjoy your new boot cuffs!